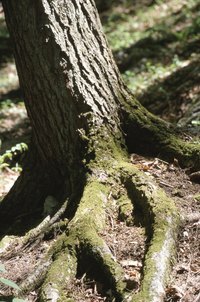 As trees age, roots may protrude through the ground, breaking up existing walkways and driveways. This creates a tripping hazard that must be addressed. Laying a walkway over a tree root allows you to keep the majestic tree in the yard while enjoying a safe walkway. Trimming the tree roots to ground level leads to rot or death; covering the roots with soil is a temporary solution that may eventually kill the tree. On-grade wood decking allows you to lay a walkway over the tree root without disturbing the tree. Lay out the area for the walkway with a garden hose or rope. Position the walkway so that it straddles the protruding root, and either side is at ground level. Measure the length of the path to determine the number of 2-by-4-inch boards needed for the path. Measure the width to determine how many decking boards are needed and the length to cut each decking board. Dig out the area for the path to remove any sod, plus 2 inches to 3 inches of the soil. Be careful when digging around the root so you do not disturb the tree. Add gravel, and tamp it down to grade so that the area receives proper drainage. Do not cover the root with the gravel. Lay 2-by-4-inch boards on edge along the outside edges of the path. Screw an 18-inch 2-by-4 piece to the inside of connecting joints if multiple 2-by-4s are needed for the length of the path. Drive stakes into the ground along the inside and outside of the 2-by-4-inch boards to keep them from shifting. Lay the decking boards across the walkway between the 2-by-4-inch boards. Leave a 1/8-inch gap between boards to allow water to run through. Screw the decking to the 2-by-4 frame rails, allowing no more than a 1-inch overhang on either side of the path. Seal the deck with two or three coats of a water-seal product for the type of wood used. Place a stepping stone at either end of the walkway if it seems too high for some users. Wood selections such as cedar, redwood and juniper are wise choices for keeping termites away from the wood walkway. If the root is very tall or there are several roots, you can add short posts to elevate the walkway. Always use pressure-treated lumber if the wood will touch the ground because this helps prevent the wood from rotting. The Housing Forum: How to Build a Wood Walkway?